News reports of Social Workers being charged with the death of a child are, thankfully, quite rare. Social Workers, by my standards, by most standards I would hope, are usually (as they should be) on the other side of that tragic equation. On the evening of November 14th, I caught a few moments of local news from Detroit Michigan. I do that from time to time, watch local news from across Canada and the States. That evening, race occupied the initial stories. At a local University in Detroit, an array of students had gathered in a vigil to support Muslim students. Two separate police investigations were underway regarding possible hate crimes. At the Grosse Point School Board, a four-hour meeting had just wrapped up. The meeting had focussed primarily on a complaint by a parent that the Principal had issued a statement embracing diversity. One hundred parents and students attended to show their unqualified support of the Principal. And then, the story about the two social workers. The husband of the older SW, a supervisor of the younger woman, was briefly interviewed. Not much was revealed. His wife has been a social worker for twenty years. Apparently, the charges are new; involuntary manslaughter and child abuse. Two state social workers have been charged with involuntary manslaughter, child abuse and more in connection with the death last spring of Detroit 3-year-old Aaron Minor, the Wayne County Prosecutor’s Office announced today. 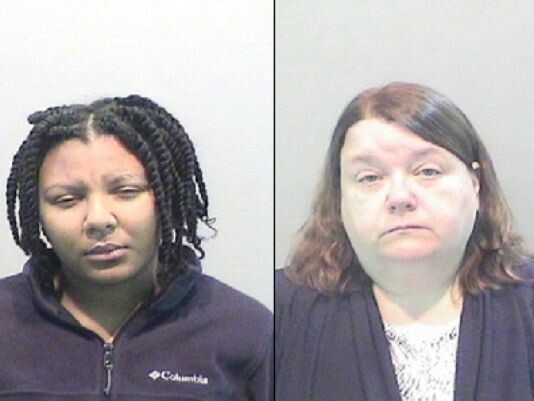 Elaina L. Brown, 24, and Kelly M. Williams, 47, both of Wayne County, were “grossly negligent and reckless in performing their duties” because they didn’t properly follow up after visiting the child’s home and finding that there was inadequate food in the house, according to a news release from the prosecutor’s office. Detroit police officers found the boys decomposed remains the afternoon of May 25 at an apartment on the 4400 block of Trumbull on Detroit’s west side. An apartment maintenance man was drawn to the unit by a bad odor and had found the body, police previously reported. Officers searched for the boy’s mother, Deanna S. Minor, after his body was discovered and found her nearly a day later in a psychiatric ward at a local hospital. Nine days earlier, police said, the mother had been found unresponsive and lying in the grass at the complex and was hospitalized for at least two days. Minor, 28, was charged in August with felony murder, second-degree murder, first- and second-degree child abuse, and failure to report a dead body. She was referred for a competency evaluation and is scheduled to appear Nov. 30 in 36th District Court. Brown, a Michigan Department of Health and Human Services Child Protective Services worker, on April 21 had received a referral from Deanna Minor’s mental health worker and she visited the home April 21 and 22, finding there was inadequate food, according to the news release from the prosecutor. Williams is Brown’s supervisor, and the two spoke on April 22, according to the news release. It’s alleged Brown never saw the mother and child again. On May 9, Brown sent a letter asking Minor to contact Child Protective Services, and she didn’t, according to the news release. CPS policy and procedure require that when a family can’t be located or doesn’t cooperate, and there are allegations of imminent risk, the social worker must contact police for a safety check and file a petition with the juvenile court, the prosecutor said. The prosecutor alleges that Brown and Williams failed to: provide a safety plan to protect Aaron, respond and follow through on reports of the mental health workers, ask police for a safety check, file a petition with juvenile court authorities or follow CPS policy and procedures. Both are charged with involuntary manslaughter, punishable by up to 15 years in prison; second-degree child abuse, 10 years, and a public officer’s willful neglect of duty, 5 years. The two were arraigned Monday morning, with a probable cause conference set for Nov. 21 and a preliminary examination set for Nov. 28. “We charged this case after much thought and deliberation. We did not make this decision lightly. We must seek to hold these defendants responsible for their alleged inaction. The ultimate result in this case was the death of a child that never should have happened,” Prosecutor Kym Worthy said in the news release. Both Brown and Williams received $25,000 personal bonds with the condition that they are not to be around children in their work capacity, according to the prosecutor. A bare telling of these details reads like so many cases that a child protection worker would be involved in. I must have investigated dozens like these in my long-ago time. Of course, beyond the rendition of this stark tale, there are gaps. Huge gaps. The initial referral came from a mental health worker. The social worker visited on two successive days, on April 21 and 22, reportedly determined that there was insufficient food. Three weeks later, on May 9th she sent the mother a letter. A week or so later, the mother was hospitalized. Nine days after that, the boys body was found. I am left wanting details of the time in between. Poverty, a shortage of food, are often factors in many neglect reports. I find it hard to believe that follow-up of some description did not occur. I couple this wishful thinking with my somewhat limited understanding of Detroit these days. I offer this story more as an awful urban fable (although it could easily be an awful rural fable.) As best I can I will follow it and comment on how it unfolds. This has not been a happy story nor will it ever become one. The child is dead. The mother has been charged. The social worker and her supervisor have been charged. Are there enough social workers to service the child protection needs of Detroit these days? There are never enough in British Columbia so I imagine that the case loads of Detroit social workers are dreadfully large. To gratuitously give it a literary sheen, this has the makings of a new child protection version of Theodore Dreiser’s An American Tragedy. Or maybe just another tragedy in a long list of tragedies in America.